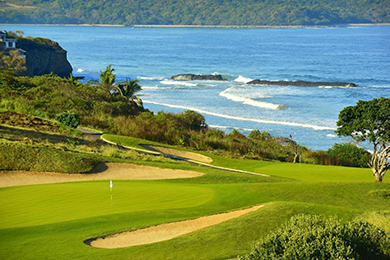 Located in the quiet Riviera Nayarit’s beautiful Punta Mita area, guests will travel more than an hour north of Puerto Vallarta to this remote property, which is far from the crowds of the city and well worth the drive. 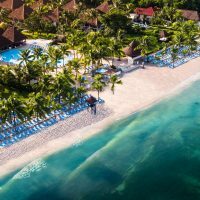 The 452-room, all-inclusive resort is part of the IBEROSTAR Hotels & Resorts chain, and families can trust the accommodations, dining and services will be luxurious, but also family-friendly. A 5-star resort, families will enjoy lots of kid-friendly activities and areas, as well as kids’ menus and hearty buffets with fare even the pickiest of kids will enjoy. 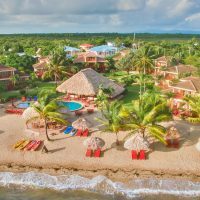 The all-inclusive experience includes nightly entertainment and many sports, and families will find the oceanfront property a relaxing destination resort that will be tough to leave when vacation ends. The smallest rooms available are the Standard Rooms, which are just under 500 square feet. Room rates are based on the view, from tropical views to ocean views. Rooms provide either a king bed or two double beds with private balconies and views of the garden or adjoining golf course. These rooms sleep four people and include small refrigerators, microwaves, coffeemakers and daily mini-bar service with snacks and drinks -- included in rates. These suites are 538 square feet in size and outfitted with two doubles or a king bed. 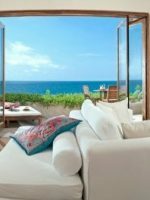 Not only are they larger than Standard Rooms, but these rooms feature private terraces with garden views and guests can walk out and through their gardens to get to the beach. These suites are great for families with small kids. 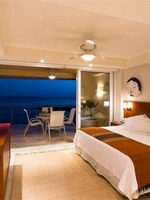 Like the beachfront rooms, these rooms are the same but located on upper floors with private balconies instead of terraces. The rooms feature the best views of the ocean. These studio suites are under 500 square feet, but larger than standard rooms with one king bed and a small sleeper sofa. A spa area is available, where guests have private access to a large, private veranda overlooking the beach and ocean with whirlpools. Spa treatment areas and lounge chairs, as well as a bar and a light bites snack area, are also available. In-room, guests have ocean views. These rooms are better suited for adults. Would definitely stay here again. Excellent food, amazing service, many activity options, clean, beautiful, value in price... the list goes on. The only small downside was the hallways can be a bit noisy at night, so if you're a light sleeper bring earplugs. Also, the resort is environmentally conscious, so if a straw is a must have for your slushy drinks I'd recommend bringing a reusable one (I personally like their commitment to reducing waste). The resort features multiple pools that are open daily from 8 a.m. to 7 p.m. 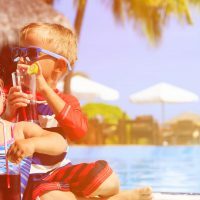 Kids will love a separate kids' splash zone with small waterslides and water play areas, while adults and older kids will be near the oversized main pool. Another kids' pool is available in the Kid's Club, for kids ages 4 to 12. A sports pool is available, dedicated to organized water aerobics, volleyball and more. Guests of spa suites have access to the Teraza Spa Jacuzzi and lounge deck, overlooking the beach. Shaded palapas are available near the pool at no charge on a first-come, first-served basis. It takes a little work to get down to the beach area, as the resort tiers the pool decks and there are beachfront rooms, but when you do get down to the beach, it's expansive and empty. Families could walk for miles seeking shells, and there are plenty of beach chairs available for guests who visit the beach. IBEROSTAR's kids' clubs for ages 4 to 12, are supervised and organized to provide a full day's entertainment and activities for kids. Included in the stay, the club has indoor and outdoor play areas. It is open from 10:30 a.m. to 4:30 p.m. On Tuesdays, the resort has a handicrafts program that begins at 10:30 a.m. with fun things for the kids to make. These are additional. Geared toward teens ages 13 to 17, this area is unsupervised and provides computers, gaming systems, Foos Ball and other games for the older kids. Wii, Xbox and Wi-Fi will keep teens happy. The club is open from 10 a.m. to 10 p.m. This isn't actually a game room in the sense the kids might think, but instead is for teens and adults with card tables and pool tables. There is also a reading lounge. The game room is located in the front of the resort, tucked off of the lobby. The resort has bicycles to enjoy for rides around the grounds daily at 10 a.m. Also daily are dance lessons at 12:30 p.m. A petting zoo is open on Sundays at 11 a.m. For sports, families can choose tennis, golf, archery, kayaking, snorkeling and more. Kids can enjoy a mini disco at the resort's theater from 8 to 8:30 p.m. nightly before the family-friendly shows officially run for the evening. On Thursdays at 4 p.m., it's face painting and clowning around at the Pintando Caritas. On Fridays at 3:30 p.m., families can participate in a "Mexican Lottery," aka bingo. Saturdays are musical trivia at 6 p.m.
As an all-inclusive resort, all meals at the resort are included with a stay, including 24-hour room service delivery. For traditional Mexican fare in a colorful setting, guests are welcome to this dinner location from 6:30 to 10 p.m. nightly. Reservations are required, and guests are asked to dress more formally. The resort's casual all-day dining facility offers international cuisine. A continental breakfast is served from 6 to 7 a.m. daily, while a buffet breakfast runs from 7 to 11 a.m. The restaurant closes until 1 p.m., when it reopens to provide a buffet lunch until 3 p.m. It closes again until 6 p.m., when it reopens to serve a buffet dinner until 10 p.m. From 11 p.m. to 1 a.m., guests can stop in for late-night snacks. As its name implies, this dinner restaurant features an array of gourmet dishes with a French and international theme. The restaurant requires formal wear and a reservation, and is open from 6:30 to 10 p.m. Sadly, the restaurant is tucked away without any views. 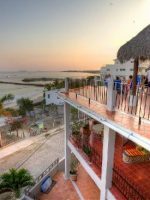 Mainly a dinner spot, the still-casual La Bahia is the resort's steakhouse. Reservations are required for dinner, when guests are requested to dress more formally. The a la carte menu is offered from 6:30 to 10 p.m. During busier periods, the restaurant opens for a buffet breakfast and lunch, from 8 to 11:30 a.m. and 11:30 a.m. to 4 p.m., respectively. For Japanese food, including sushi and sashimi, this dinner-only spot is open from 6:30 to 10 p.m. Guests do not need reservations, but are required to dress more formally. Alas, this spot doesn't offer any views either. Wi-Fi is complimentary across the resort. In-room babysitting service can be arranged with reservations for a maximum of two kids per sitter, 24 hours a day. 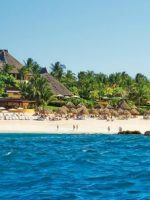 The Riviera Nayarit area is a year-round vacation destination, with the holidays, spring breaks and summer months most popular for visits. To enjoy less crowds and better deals, visit in the fall or late spring. 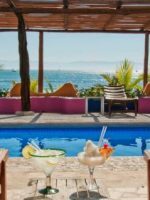 The resort is located 25 miles north of Puerto Vallarta Intentional Airport, however, with windy roads and traffic, it could take an hour to get to the resort. The resort, at an additional cost, can arrange transportation to and from the airport. Once on the resort, guests typically don't leave except through resort-arranged excursions. 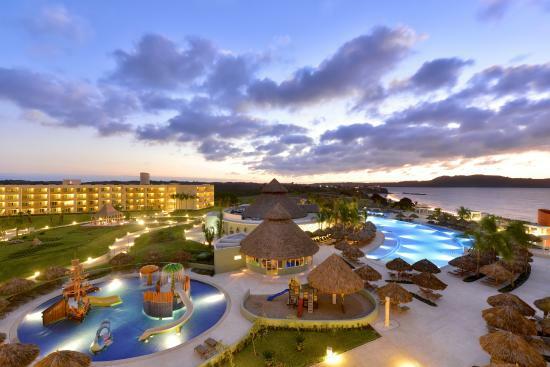 The Riviera Nayarit area is a coastal stretch of small towns filled with shops and surfers, and if your family is adventurous, rent a car and explore these areas, as well as the tropical parks surrounding the resort. 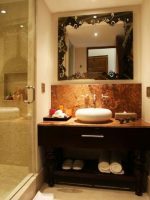 The resort has an intimate spa, tucked away on the lower floors beneath the lobby. Full services are available, including massages, body treatments, facials, scrubs and more.